Author: Buckley, Christopher Set In . . . Description: The father of our country slept with Martha, but schlepped in the District. 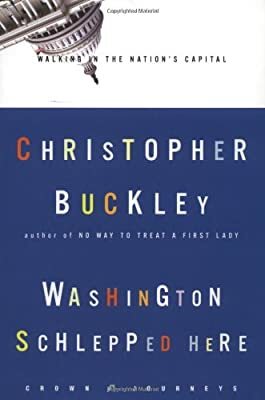 Now in the great man’s footsteps comes humorist and twenty-year Washington resident Christopher Buckley with the real story of the city’s founding. Well, not really. We’re just trying to get you to buy the book. But we can say with justification that there’s never been a more enjoyable, funny, and informative tour guide to the city than Buckley. His delight as he points out things of interest is con-tagious, and his frequent digressions about his own adventures as a White House staffer are often hilarious. In Washington Schlepped Here, Buckley takes us along for several walks around the town and shares with us a bit of his “other” Washington. They include “Dante’s Paradiso” (Union Station); the “Zero Milestone of American democracy” (the U.S. Capitol); the “Almost Pink House” (the White House); and many other historical (and often hysterical) journeys. Buckley is the sort of wonderful guide who pries loose the abalone-like clichés that cling to a place as mythic as D.C. Wonderfully insightful and eminently practical, Washington Schlepped Here shows us that even a city whose chief industry is government bureaucracy is a lot funnier and more surprising than its media-ready image might let on.